The 2006/2007 slot car racing schedule will be posted very soon to let you know about all the slot car racing action this coming year. In the past the busiest night of the week has been on Friday nights. Rest easy... our Friday night 2006/2007 racing program is starting soon. 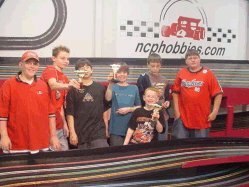 NCPHOBBIES.COM hosts weekly racing on our 135 foot slot car hillclimb, 60 foot oval, 1/8 mile slot car drag strip, on our HO slot car track, and on our 1/32 slot car track in two separate rooms. The list of requests for a ncphobbies.com slot car racing photo album were getting to numerous to count so we had to take action. Here is a gallery of racing pictures both recent and historic at ncphobbies.com. Get ready for the 2006/2007 racing year by visiting the ncphobbies.com 1/24 Slot Car online store.